President Obama and Mitt Romney met for their second debate in a town hall format. HEMPSTEAD, N.Y. - President Obama hoped to rebound from a poor performance as he squared off tonight against Mitt Romney in the second of their three nationally televised debates. The incumbent Democrat and his Republican challenger met for 90 minutes at the Hofstra University on Long Island, in a debate sponsored by the Commission on Presidential Debates. Candy Crowley of CNN was the moderator for the townhall-style meeting, which was to focus on foreign policy as well as economics. The debate was shown live on network television and C-Span, beginning at 9 p.m. EDT. Boston.com, BostonGlobe.com, and “Political Intelligence” offered a live blog below to chronicle the pre-debate proceedings and debate itself. All three also offered contemporaneous fact-checking and analysis from Globe reporters expert in various fields, creating a unique “second-screen” experience for viewers seeking additional context for what they are seeing on TV. The blog also served as a window into the debate to those not near a TV. Obama and Romney face a quick turnaround before their next debate. It is scheduled for Monday night at Lynn University in Boca Raton, Fla.
Vice President Joe Biden and Republican vice presidential nominee Paul Ryan had their lone debate last week at Centre College in Danville, Ky.
10:40 p.m. - Nearly 10 minutes late, the debate ends. Obama took Romney’s invocation of the 47-percent remark to hammer him for stating it. Says that as president, he is not anti-free enterprise, as labeled. Thanks for logging on tonight. Sorry for some technical challenges that slowed our usual rapid-fire pace! 10:35 p.m. - Man asks final question to Romney: What do you believe is the biggest misperception the American people have about you as a man and as a candidate. Romney thanks him for the chance to define himself. He says he is not as has been defined by the president’s campaign. “I care about 100 percent of our people,” says Romney, raising his controversial “47-percent” comment himself for the first time in the night. Then he segues to how he has been compassionate as a Mormon missionary, and how he saved the Olympics, and got people insured as governor of Massachusetts. “I understand we can get this country going again. We don’t have to settle,” he says. 10:33 p.m. - Crowley, trying to wrap up debate, nonetheless asks how do you return manufacturing back to US? Romney says answer is easy: leveling the playing field. 10:29 p.m. - Obama says US needs to create jobs here, in part by lowering corporate rates. But he wants to close loopholes that benefit companies moving to China. “Now, Governor Romney wants to expand those tax breaks,” says Obama. 10:27 p.m. - Woman asks Romney about outsourcing jobs and how to stop it. Romney says the country has to make it more attractive to foreign investment, while also going after China for trade infractions. 10:25 p.m. - As the debate winds down, the spin room in the media center is filling up. 10:24 p.m. - Crowley re-centers question on why not have an assault weapons ban in light of recent mass killings. Romney says he signed a gun control bill that was supported both by advocates and gun critics. 10:21 p.m. - Romney says he is not in favor of new gun regulations, “but enormous measures” to enforce existing laws. 10:18 p.m. - Woman asks Obama what he has done to stop sale of AK-47s, as he promised during the 2008 Democratic National Convention. The president is largely dodging this question, citing how he has comforted victims of gun violence, before saying that he has sought broader solutions not just to guns, but better education and community development. 10:15 p.m. - Crowley notes that Secretary of State Hillary Rodham Clinton has taken responsibility. Obama says that is true, but she works for him, and that he is ultimately responsible. “The suggestion that anybody on my team ... would play politics or mislead, when we lost four of our own,” is offensive,” says president. 10:12 p.m. - President concludes by saying he cares for staff, since he has to greet coffins when they come home. But, Romney says, there were days that went by before the administration conceded the attack was a terrorist attack, and that the president went off campaigning in the aftermath of the assassination of an ambassador. 10:09 p.m. - Man says he and a group of co-workers wondered yesterday, who refused extra security for consulate in Benghazi, Libya. President says he is personally concerned about diplomat safety, so he ordered beefing up security at all embassies, an investigation into what happened, and a plan to hunt down the killers. Then, again, he pivots to Romney for criticizing the administration even before the fires were out. 10:07 p.m. - On China investments, Romney says he has some blind trust investments in China, but then he turns to Obama and asks if he had looked at his own pension investments. “I don't look at my pension; it’s not as big as yours,” replies president. 10:05 p.m. - Romney replies, “I did not say that the Arizona law was a model for the nation,” only it’s “e-verify segment” was a model. He also retorts that he did not stir opposition to immigration reform when Obama controlled both chambers of Congress and had his own chance to make immigration reform. 10:02 p.m. - Obama says he has tried to do everything he can - on his own, and with a reluctant Congress - to make changes. They include making legal immigration easier, and blocking the border better, and by going after gang-bangers and other troublemakers. He also highlights his work to provide pathway to citizenship for children of illegals who have been in school. “His main strategy, during the Republican primary, was, ‘We’re going to encourage self-deportation,’” Obama recalls of Romney. 10 p.m. - Romney ticks through his immigration proposals, including encouraging legal immigration and turning off “magnets” for illegals, such as giving them driver’s licenses. Then, like Obama has been doing, he pivots to his opponent to accuse Obama of passing his own ideas. “Why did he fail?” asks Romney. 9:59 p.m. - Crowley steers Romney to woman questioner, who asks him about his plans for immigration. These last few questions have been good for the president and not great for Romney. 9:55 p.m. - Once again, Obama uses end of his answer to attack Romney’s policy proposals, not just lay out his plans. 9:53 p.m. - Man asks president how he has made his life better; says he is not sure he can vote for him again. The president ticks of his record. “Does that mean you’re not struggling?” says president. “A lot of us are not." But he says his plans are better. 9:49 p.m. - This s a tee ball for the president. “Well, first of all, I think it’s important to tell you, we did come in during some tough time. ... But we have been digging ourselves out,” says Obama. Then he pivots to linking Romney to Bush policies. Says he wants tax cuts, has been a businessman with China. “Governor, you’re the last person that’s going to get tough on China,” says Obama, turning to look at Romney. 9:47 p.m. - Woman asks Romney to cite differences with George W. Bush. 9:44 p.m. - Obama says that Romney favors policies that are “not the kind of advocacy women need.” He cites his lack of support for Planned Parenthood, and no position on the Lilly Ledbetter law. 9:40 p.m. - Romney formally answers that he respects women, as shown by the number of women he sought out for his Cabinet. “We're going to have to have employers in the new economy ... that are going to be so anxious to have good employees they’re going to hire women,” he says. 9:38 p.m. - Young woman asks president how he will ensure pay equality for women. “This is a great question,” says president, who has hammered Romney for not supporting pay equity. Romney usually retorts that women have suffered in this economy, and he will help them by creating more jobs. 9:36 p.m. - Crowley asks Romney, if the numbers don’t add up, would you look at Clinton-era tax rates. “Of course they add up,” says Romney, recalling how he balanced budgets as bsuinessman, Olympics chief, and governor of Massachusetts. Romney then goes after the president, saying his 2008 promises haven't been achieved. “I know what it takes to balance budgets,” says Romney. 9:34 p.m. - Obama says, “You wouldn’t have taken such a sketchy deal” when he was a venture capitalist, as he accuses Romney of not being clear about his plans. 9:34 p.m - The theatrics of this are stunning: The two candidates standing just feet apart, debating their respective policies, with an audience right at their heels. 9:32 p.m. - Romney says he doesn’t favor tax cuts for wealthy, but to lower rates for all taxpayers so job creators can retain more capital. 9:29 p.m. - “Governor Romney has a different philosophy,” says president. He cites “60 Minutes” interview when Romney defended his tax rate. “That is exactly the type of top-down economics that’s not going to work,” says Obama. 9:27 p.m. - Obama starts by saying his philosophy on taxes is simple: relief for the middle class. That said, if it is a moral obligation to address the deficit, the wealthy must pay more, says president. 9:24 p.m. - Fourth question is about taxes, and to Romney. What deductions would be cut, asks woman referring to her notes when she gets stuck? Romney says he wants to cut middle-income taxes, to help middle class recover from recession. After cutting rates, Romney says he will limit deductions and credits for people at the high end. “The top 5 percent of income-tax payers will continue to pay 60 percent of the taxes,” he says. He also says people can decide which deductions they want to keep, as well. 9:22 p.m. - This debate is white-hot in just the first 20 minutes. He says gas prices were lower when he took office because the economy was in recession. If Romney is elected, they might get back that way because he wants to pursue the same economic policies, the president says. “That’s not an energy strategy for the future,” says Obama. 9:20 p.m. - Romney and Obama are clashing over extent of oil production on federal lands has been cut in past four years. 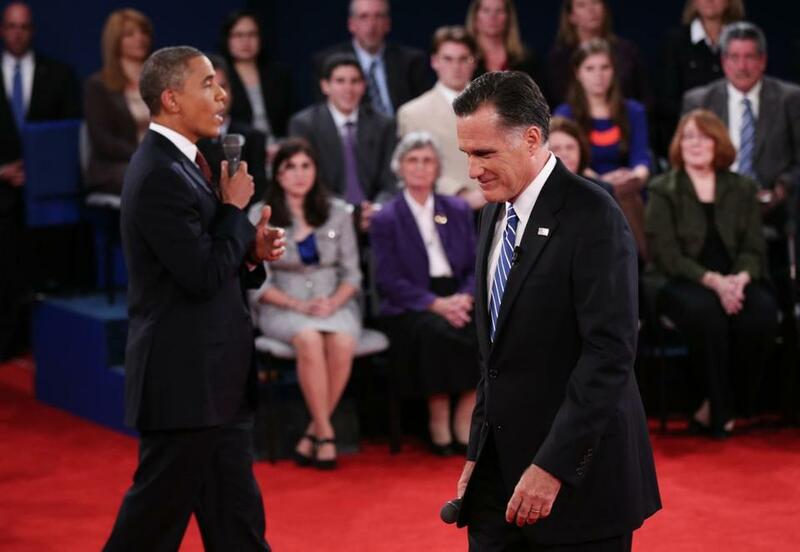 As Obama walked away, Romney followed him, challenging the president's answer. “You’ll get your chance in a minute because I’m still speaking,” Romney says as president of the United States stands up to speak. 9:17 p.m. - Crowley follows up, “Are we looking at the new normal,” with $4 per gallon gas? Obama says demand is up, but so is production. But then, for third answer, he goes after Romney’s record, saying he was proud to shut down a coal-burning plant when he was governor. 9:14 p.m. - For the second consecutive answer, Obama takes the fight to Romney, saying his energy plan is focused on gas companies, not clean energy companies like him. Romney says gas production not from federal lands - where president cut permits - but private investment that the administration fought in some cases. “I want to make sure we use our oil, our coal, our gas, our nuclear, our renewables,” says Romney. 9:12 p.m. - Voter asks about high gas prices, saying energy secretary says it’s not his problem to keep prices low. Agree? President says best thing to lower gas prices to increase energy sources, but also to increase fuel efficiency for future cars to use half as much gas. 9:10 p.m. - Obama pours it one in rebutting Romney answer on auto industry. “Governor Romney says he has a five-point plan. He doesn’t have a five-point plan; he has a one-point plan,” says president, referring to tax cuts for the wealthy. 9:08 p.m. - Sorry, technical problem. 9:06 p.m. - “More debt and less jobs; I’m going to change that,” says Romney. 9:03 p.m. - First question to Romney from 20-year-old student: How make sure I have a job after I graduate. “Your question is one being asked by college kids all across this country,” says Romney. The president is perched on the edge of his stool. Romney says he has to make college more affordable and then make sure there is a job at the ready for them when they graduate. 9:02 p.m. - Crowley introduces the candidates. They shake hands at center stage. 9 p.m. - And the cable and broadcast networks are on the air. 8:59 p.m. - One minute air. Crowd is silent. 8:54 p.m. - CNN’s Candy Crowley, the moderator, is welcomed on the stage. Viewers will notice a pronounced wave in her hair. She repeats the no-electronic device warnings. 8:53 p.m. - Both Ann Romney and first lady Michelle Obama are both in the hall - and both in pink. Meanwhile, Governor Deval Patrick has arrived at the media center to participate in spin duty after the debate. 8:50 p.m. - Hofstra president is wrapping up a long commercial of sorts for his school, highlighting its offerings. He noted that all students allowed in the hall tonight are registered to vote and plan to do so on Nov. 6. 8:46 p.m. - President of Hofstra University profusely thanking commission and his own staff for pulling off this debate. It really is quite a logistical feat, especially as you try to keep a college running at the same time. 8:39 p.m. - McCurry replaced Paul Kirk, the former Kennedy aide and Massachusetts senator who started the commission with Fahrenkopf. 8:37 p.m. - The setting is this: About 80 people clustered around the candidates, asking them questions. And then an audience of students and invited guests watching from the stands and arena floor. 8:35 p.m. - The Commission on Presidential Debate co-chairs - Frank Fahrenkopf and Mike McCurry - are now addressing the audience as we get the rules laid down, etc. Mitt Romney and his team have arrived at the debate hall and are holding, as is the president. 8:18 p.m. - The White House pool report had President Obama leaving his hotel at 8 p.m. on the dot. 7:07 p.m. - Besides Kerry, those working the spin room pre-debate including former New Hampshire Governor John Sununu (for Romney), Maryland Governor Martin O’Malley (for Obama), and former Vermont Governor Howard Dean. As Kerry was just getting started with the media, Dean broke through, shook his hand to say hello and then chit-chatted with his 2004 presidential rival. Kerry remarked that Dean looked like he had lost weight. 6:35 p.m. - My colleague Matt Viser and I ran into Senator John Kerry - who has been playing Romney for Obama’s prep session - and a scrum quickly formed around the Massachusetts Democrat. He lit into Romney, saying his claims of bipartisanship in Massachusetts were exaggerated, that he constantly vetoed bills and had then overridden, that he did health care because the Legislature wanted it but now, in the most “flim-flam” episode ever, is running away from the same plan at the federal level. Kerry also tweaked Romney, saying he has a fixation on elevators: He had one locked down for his personal use while governor, he notes, and has plans to install one for his cars at his California home. Viser wrote up the commentary, but it’s clear from Kerry’s aggressiveness that Obama is ready to go after his Republican rival tonight. The incumbent Democrat and his Republican challenger were meeting for 90 minutes at the Hofstra University on Long Island, in a debate sponsored by the Commission on Presidential Debates. Candy Crowley of CNN was the moderator for the townhall-style meeting, which was to focus on foreign policy as well as economics. The debate was being shown live on network television and C-Span, beginning at 9 p.m. EDT. Boston.com, BostonGlobe.com, and “Political Intelligence” will offer a live blog below to chronicle the pre-debate proceedings and debate itself. All three will also offer contemporaneous fact-checking and analysis from Globe reporters expert in various fields, creating a unique “second-screen” experience for viewers seeking additional context for what they are seeing on TV. The blog will also serve as a window into the debate to those not near a TV.